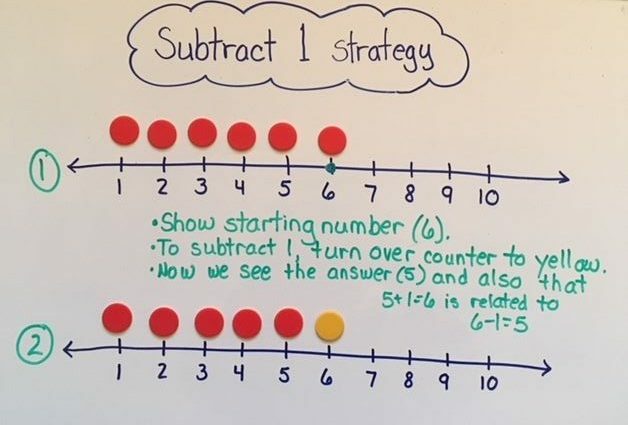 This is part three in a series of strategies regarding addition and subtraction strategies. 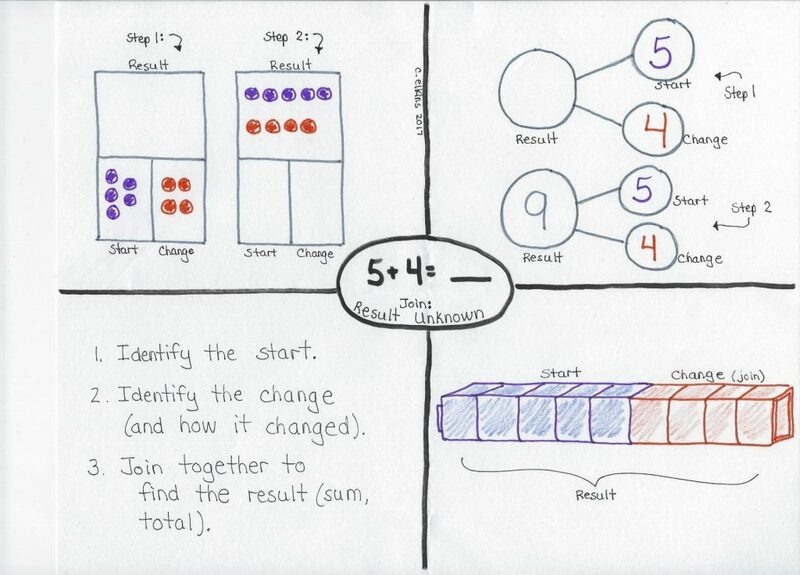 This part will focus on a variety of strategies to help toward memorization of facts, meaning automatic computation. 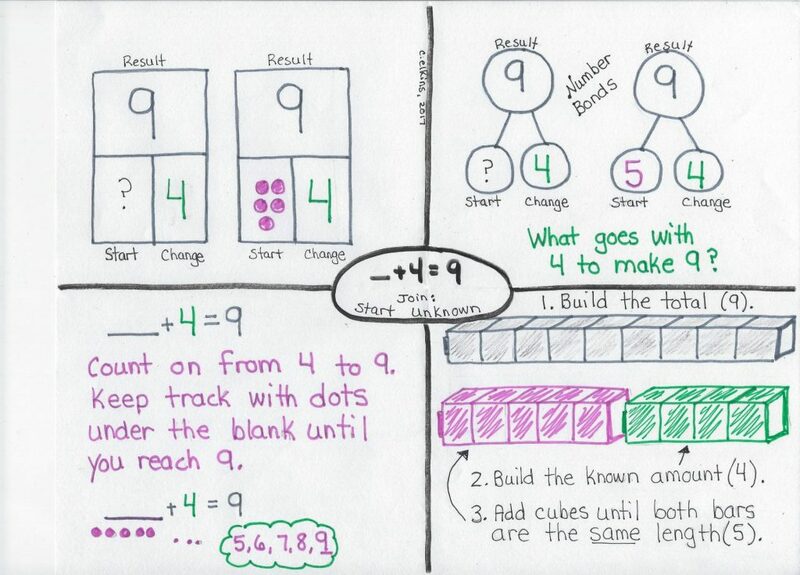 While children are learning their number bonds (building up to 5 in KG, to 10 in first grade, and to 20 in second grade), there are other facts which cross several number bonds that students can work towards. 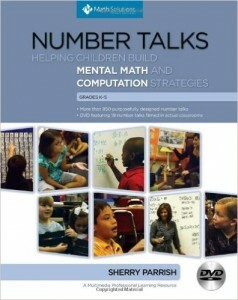 These strategies to build mental math automaticity are highlighted below. 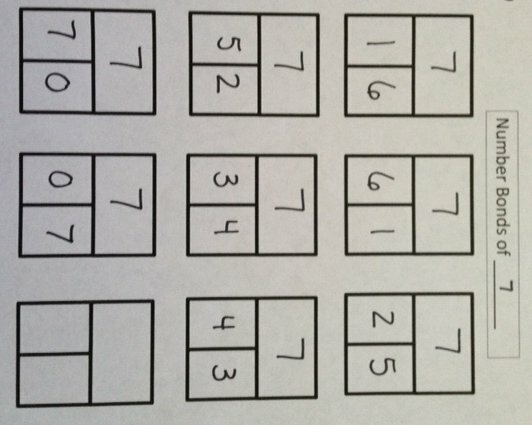 Get some freebies in the section on doubles / near doubles. 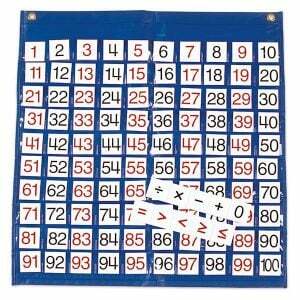 The value of the number does not change when zero is added or subtracted. 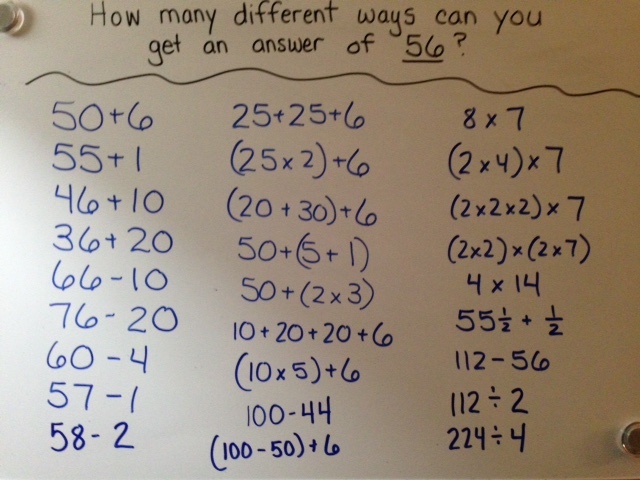 The answer is always zero when you take away / subtract all. Adding 1 results in the next number in the counting sequence. 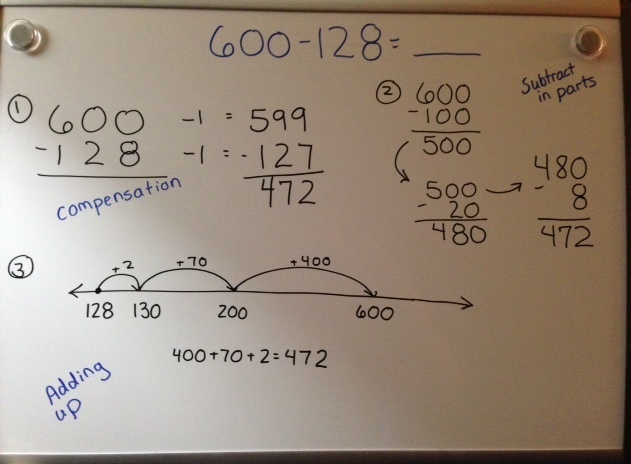 Subtracting 1 means naming the number that comes right before it in the counting sequence. 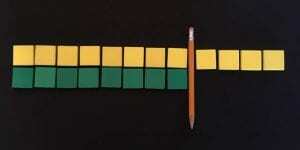 With manipulatives, lay out an amount for student to count. Slide one more and see if he/she can name the amount without recounting. 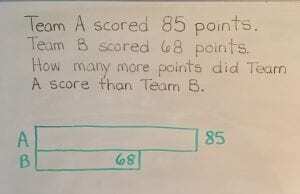 Do the same as above, but take one away from the group to see if he/she can name the amount without recounting. 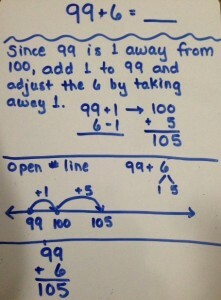 Show this concept using a number line. 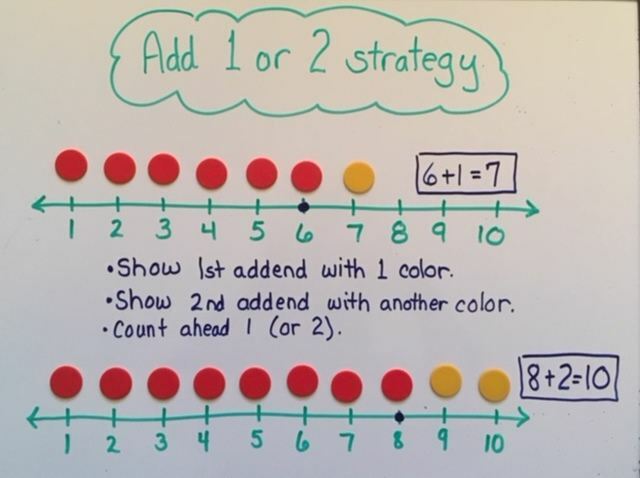 After +1 or -1 strategies are in place, then go for +2 or -2 for automatic processing. 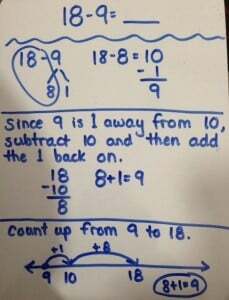 If subtracting two sequential numbers (ie 7 subtract 6), the answer is always one because you are taking away almost all of the original amount. 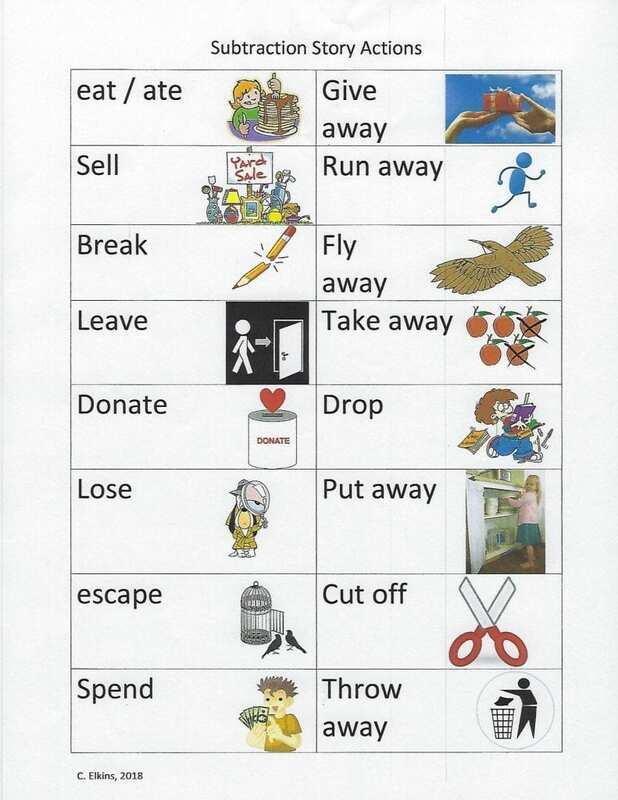 Guide students to writing these types of problems. 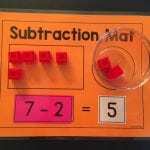 Relate these to subtracting 1 problems. 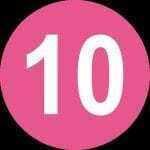 If 10-1 = 9; then 10 – 9 = 1. 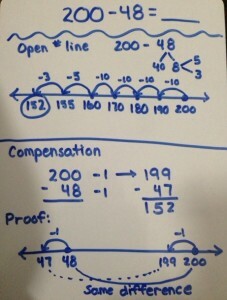 Show on a number line. 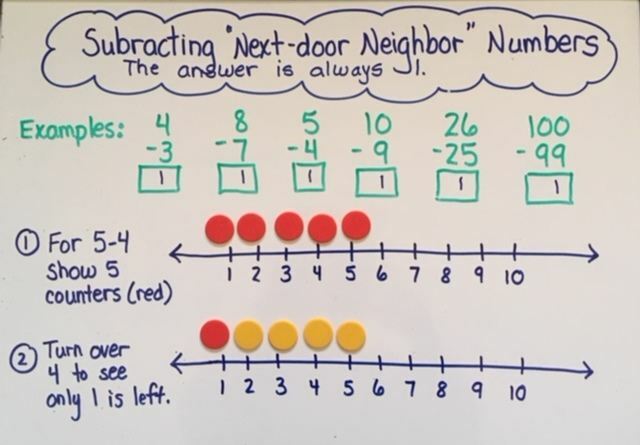 In Part 1 I focused on a numerical fluency continuum, which defines the stages a child goes through to achieve number sense. 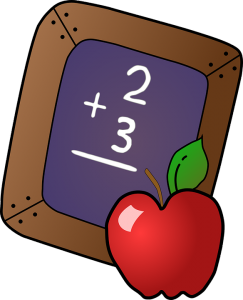 After a child has a firm grasp of one-to-one correspondence, can count on, and understands concepts of more and less, he/she is ready to explore part-part-whole relationships which lead to the operations of addition and subtraction. That will be the focus of this post. 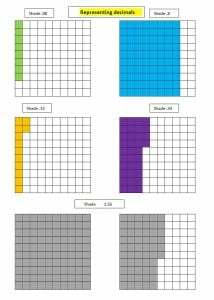 Read on for free number bond activities and a free number bond assessment! 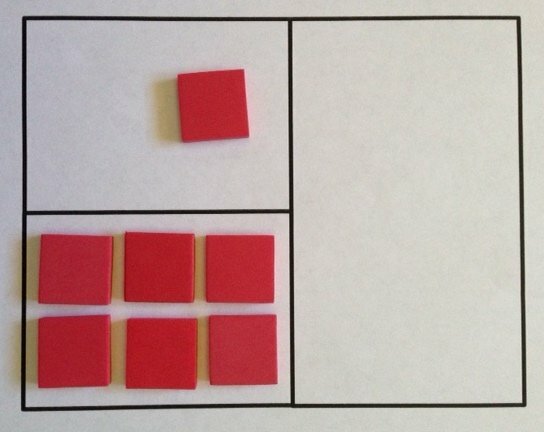 One way to explore part-part-whole relationships is through various number bonds experiences. 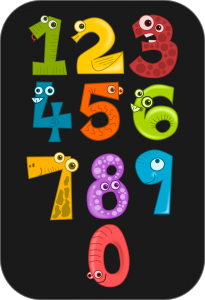 Number Bonds are pairs of numbers that combine to total the target or focus number. When students learn number bonds they are applying the commutative, identity, and zero properties. 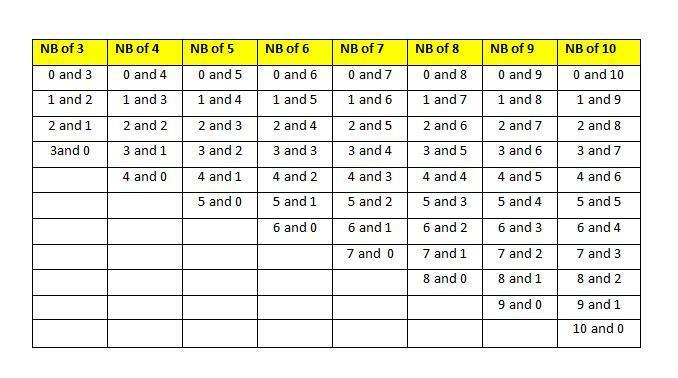 Do you notice from the chart below that there are 4 number bonds for the number 3; 5 number bonds for the number 4; 6 number bonds for the number 5, etc? And . 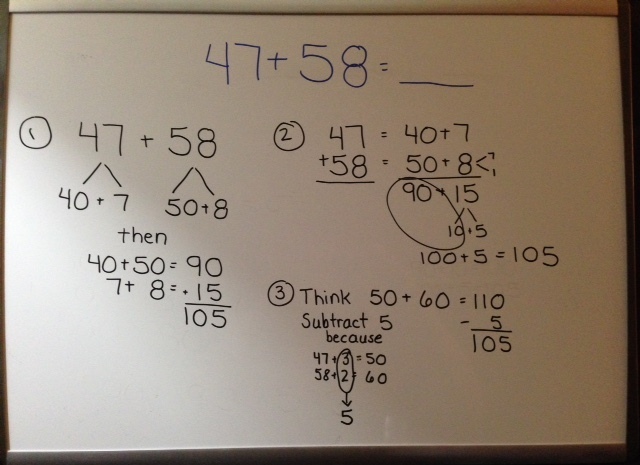 . . half of the number bonds are actually just the commutative property in action, so there really aren’t as many combinations for each number to learn after all. 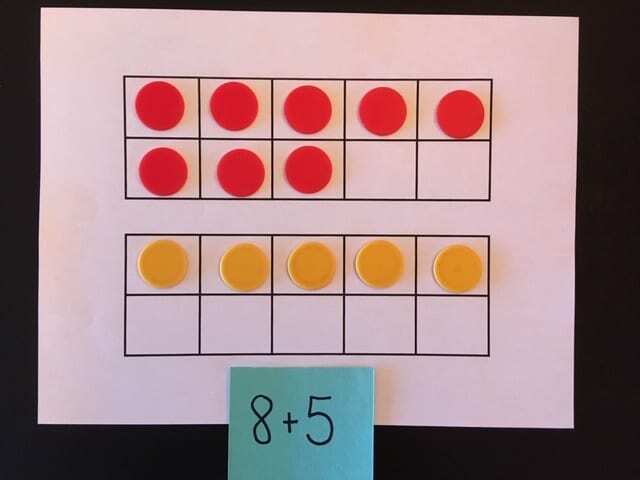 KG students should master number bonds to 5. 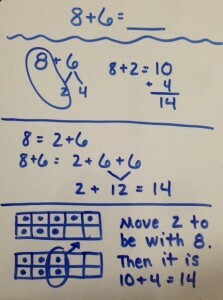 First graders should master number bonds to 10. 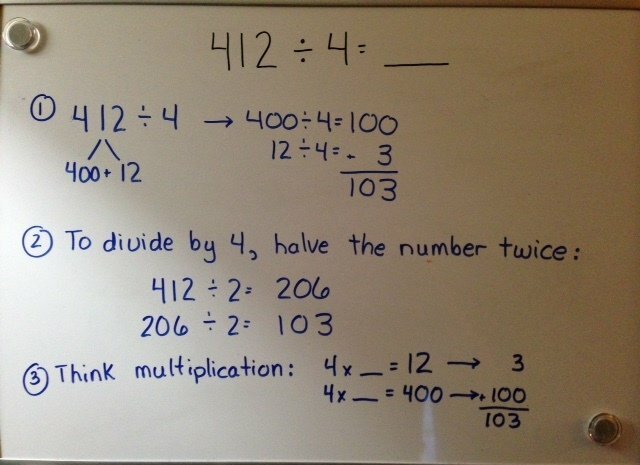 Ideally, students should focus on the bonds for one number at a time, until mastery is achieved. In other words, if working on the number bond of 3, they would learn 0 and 3, 3 and 0, 1 and 2, 2 and 1 before trying to learn number bonds of 4. See the end of this post for assessment ideas. 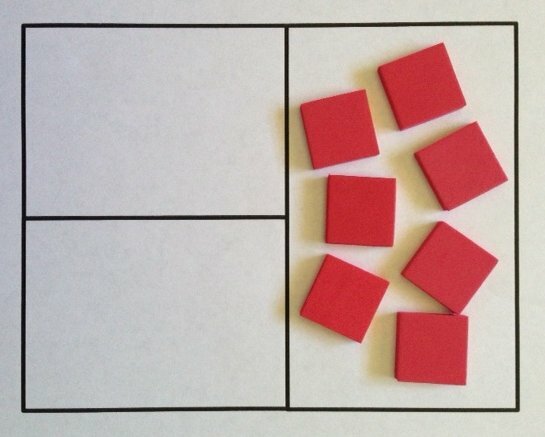 Ten Frame cards: Use counters to show different ways to make the focus number. 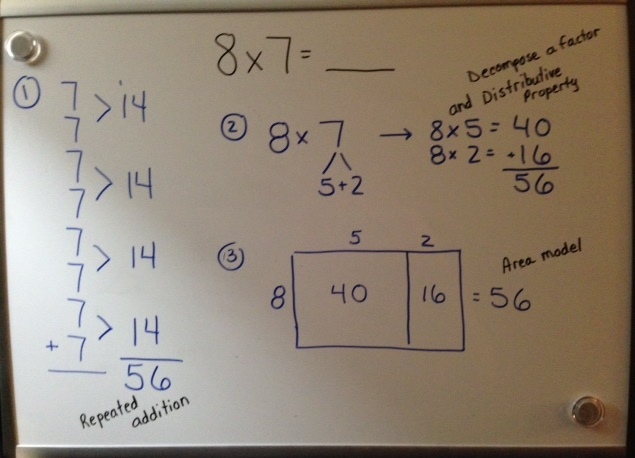 (See above example of 2 ways to show 6.) 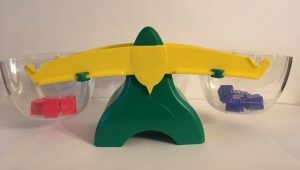 Shake and Spill games are also great for this: Using 2-color counters, shake and spill the number of counters matching your focus number. See how many spilled out red and how many spilled out yellow. 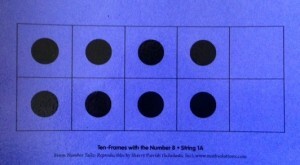 Record results on a blank ten-frame template. Repeat 10 times. 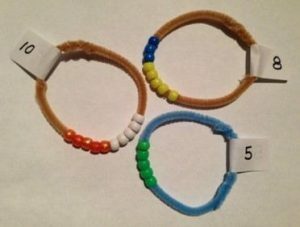 Number Bond Bracelets: Use beads and chenille stems to form bracelets for each number 2-10. 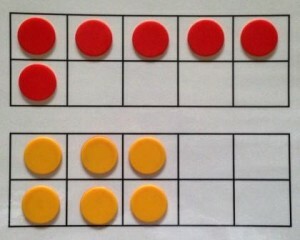 Slide beads apart to see different ways to make the focus number. Reckenreck: Slide beads on the frame to show different combinations. 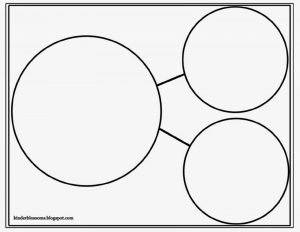 Part-Part-Whole Graphic Organizers: Here are two templates I like. Start with objects matching the focus number in the “whole” section. 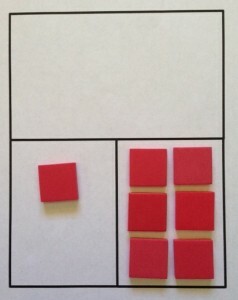 Then move “part” of them to one section and the rest to the other section. 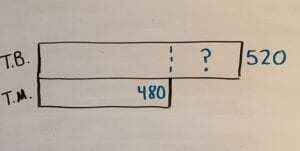 Rearrange to find different bonds for the same focus number. 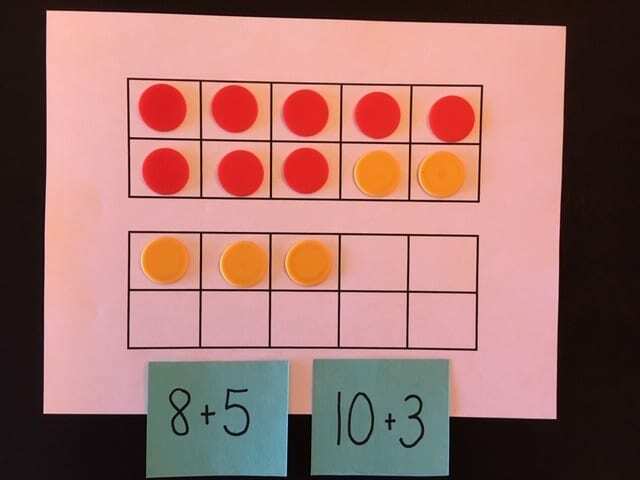 Start students with manipulalatives before moving to numbers. 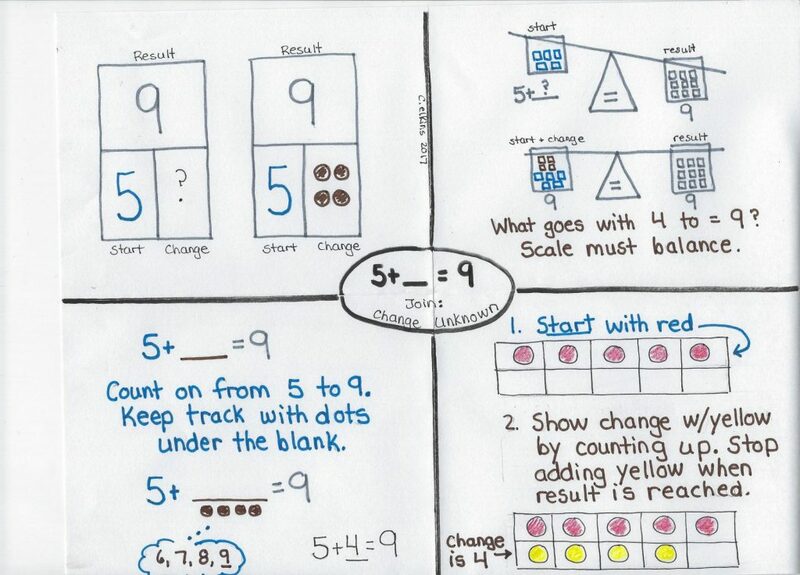 Or use numbers as a way for students to record their findings. 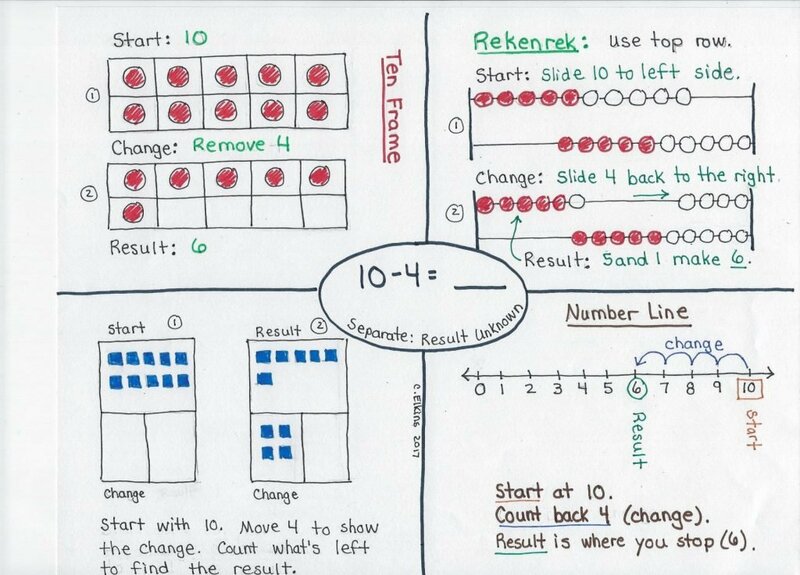 Once students have a good concept of number bonds, these part-part-whole organizers are very helpful when doing addition and subtraction problems (including story problems) using these structures: Result Unknown, Change Unknown, and Start Unknown. 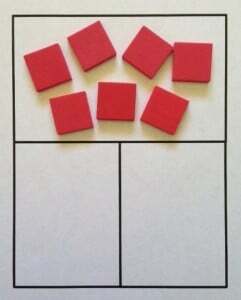 Children should use manipulatives at first to “figure out” the story. 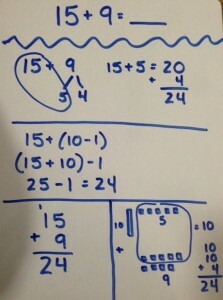 Here is an example of a result unknown subtraction story: “Mom put 7 cookies on a plate. I ate 2 of them. How many cookies are still on the plate?” To do this start with the whole amount (7) in the large section. Then move the 2 that were eaten to a “part” section. Count how many are remaining in the “whole section” to find out how many are still on the plate? 7 – 2 = ____. 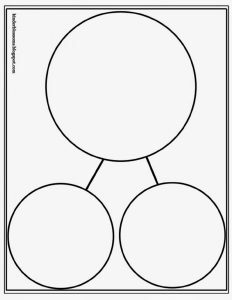 How are number bonds related to fact families? 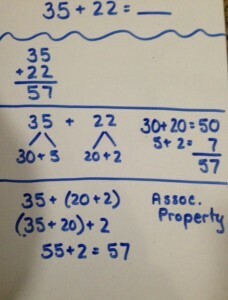 A fact family is one number bond shown with 2 addition and 2 subtraction statements. 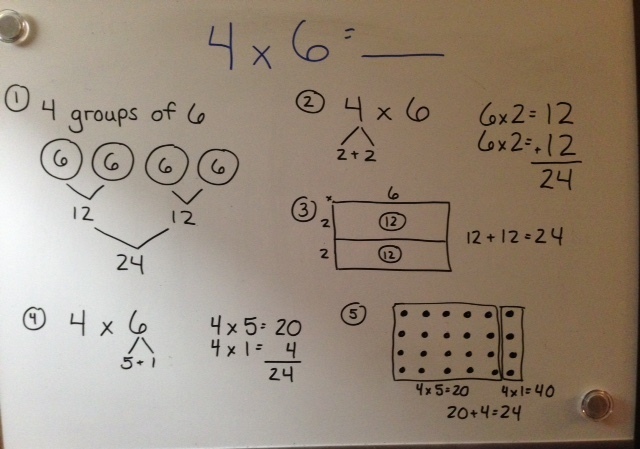 Ex: With number bonds 3 and 4 for the number 7, you can make 4 problems: 3 + 4 = 7; 4 + 3 = 7; 7-3 = 4; and 7-4=3.